After a copious amount of student engagement in the Mountain Color Art Show, Nicholas County High School students won four of the five placings in the Richwood art competition. The show was held on the Sunday of October 7 and continued until October 13 at the Richwood City Hall Auditorium. According to the NCHS art teacher, Pam Cox, there were around 30 student submissions from the school. “I’m always impressed with what our kids can do!” said Mrs. Cox, referring to the awe-inspiring creations of the budding artist. Nicholas County High School has possessed a winner in most of the primary spots to enter their art in the show. When asked what aspect of the high school students’ masterpieces stood out to her the most, she replied with, ”The variety.” The pieces featured a spectacular array of styles, mediums, colors, and chosen subjects. 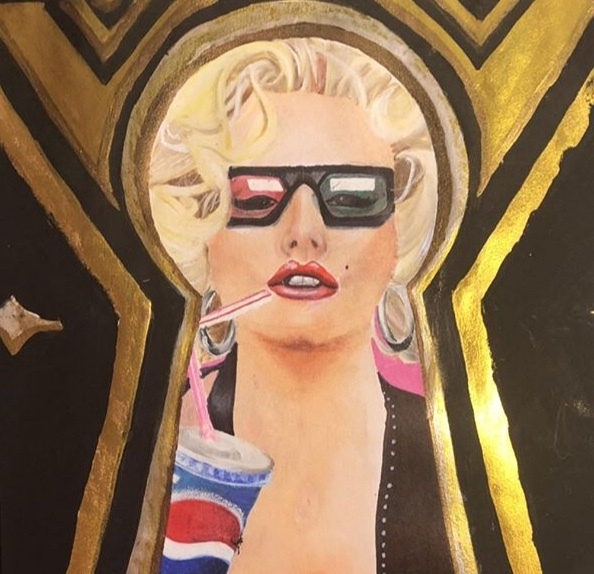 A particular student selected a rather interesting subject matter depicting Marilyn Monroe peering through a keyhole (the featured image of this article). Cameron Thomas is part of Mrs. Cox’s AP Art class, where students were mandated to enter two art submissions. Each student is required to create a series of 12 works expressing a specific subject or idea.